Speaking can be a daunting activity for many students, especially those who are hampered by poor literacy skills (Eales, Neale & Carroll, 1999) or shyness. They feel reluctant to speak in class for fear of making errors and being laughed at by their peers. Consequently, as an EFL teacher preparing students for the Cambridge English examinations, my primary concern is to assist my students in developing their speaking skills with a view to enhancing their performance in their speaking test, which is a compulsory part of their examination. 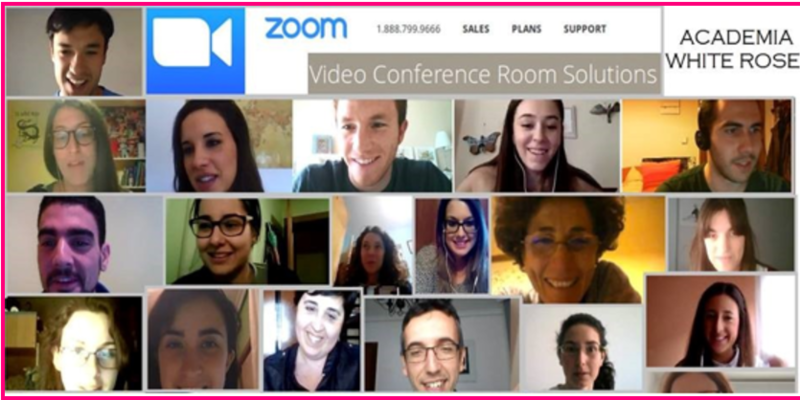 With this in mind, I designed a project by means of the videoconferencing tool, Zoom, to provide the students with additional speaking practice outside the classroom. In the last decade several studies have examined language learner interaction, mainly in synchronous video communication. Videoconferencing can be defined as “synchronous audio and video communication through computer and telephone networks between two or more geographically dispersed sites” (Lawson et al., 2010, p. 295). It provides instantaneous interaction since students communicate with their peers in real time, as well as constituting a solution for EFL learners who have fewer opportunities to communicate in the target language (Ino, A. & Yabuta, Y. 2015). Furthermore, communication on videoconferencing includes eye contact, gestures and turn-taking, which can enhance students’ positive attitudes and motivation to learn the target language ( Jauregi, Graaff, Bergh & Khriz, 2012). Firstly, Zoom was used to create the learning platform to enable the students to interact with each other online. I chose a paid version for the benefit of its longer recording time. These students could access the platform via their smartphone, other mobile devices or their desk computer. The students were also requested to download the application Google Drive on their device so that I could share the activities with them. Next, I devised bi-weekly tasks with the aim of guiding the students towards developing proficiency in speaking. Reading materials provided the context for the debates. Vocabulary exercises were prepared to check for comprehension. Questions were set to prompt interaction on videoconferencing. Eighteen students of C1 level volunteered to participate in the study, since they were preparing for their Cambridge English exam and they were aware that they would benefit from the learning experience. In order to provide the students with the opportunity to be exposed to authentic texts, which tend to be different from those in their coursebooks, seven articles covering a range of topical themes were selected from the BBC and The Guardian newspaper as reading resources; for example, ‘What is healthy eating?’, ‘Five ways students can boost their confidence at uni’ or ‘The world’s most polite country’, among others. 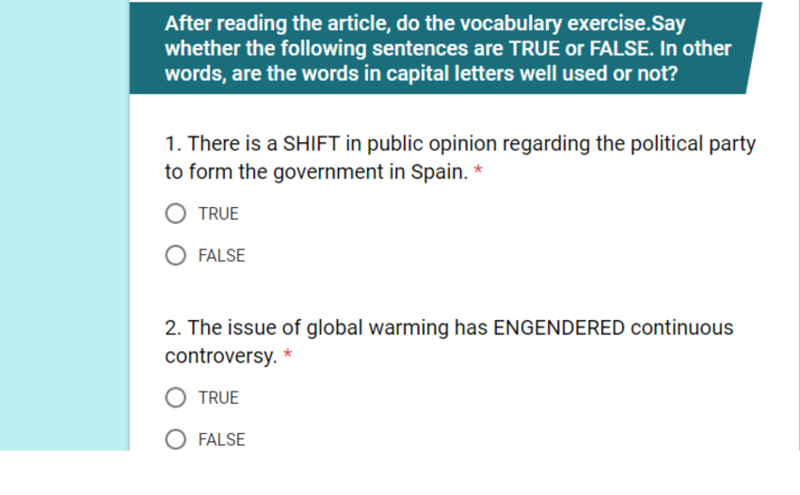 The seven vocabulary exercises comprised True/False or Multiple Choice questions, and in each exercise the students acquired ten new words. Such exercises were written on Google Docs forms, which were later shared with the participants. Below is an example of a vocabulary exercise. I invited the students to book their meeting room on a bi-weekly basis. In other words, their meetings were scheduled at their convenience, which is an advantage of using such technology. Once they had agreed on their preferred time and day, they would take part in their respective debates in groups of three, and each session lasted for about 10-15 minutes. To ensure that I could watch and monitor their progress in speaking, each video was recorded by the students themselves and uploaded to the learning platform. It’s important to download all the videos and save them since they are not permanently stored on Zoom. An example of this is shown below. Permission to share this recording was obtained via a disclosure form. The participants were fully engaged in their online interactions, as they reported that they were motivated and comfortable in expressing their views due to their familiarity with the subject under discussion and lack of pressure. They performed their online tasks without the anxiety of being observed or intimidated by their peers. They could think about their ideas and prepare their questions prior to their online debates. They made an effort to incorporate the newly acquired lexis in their discourse, as they knew that using a wide range of lexical resource would enhance their output. They felt more independent when managing their online interactions without my help, and could make decisions in terms of when and how to start their debates. Constant practice using this videoconferencing software led to confidence building and fluency development, as perceived in this study case. What is crucial is the fact that with videoconferencing students can see each other’s body language, such as gestures or facial expressions, which facilitates communication. Thus, my students could learn the techniques of how to initiate, respond and take turns during their discussions, which they later applied in their face-to-face class discussions. I noticed some improvement in my students’ speaking performance in the classroom as they felt more confident and produced extended discourse with greater ease. The scaffolding provided by videoconferencing was influential to this effect. The conclusions I can draw from this novel learning experience are that videoconferencing can stimulate students to be engaged in peer interaction, assist in increasing students’ confidence in speaking, and provide speaking practice prior to face-to-face class discussions. I would certainly recommend that teachers should implement videoconferencing in their teaching as a motivational tool to enhance students’ speaking skills. Eales, R. T. J., Neale, D. C. & Carroll, J. M. (1999). ‘Desktop videoconferencing as a basis for computer supported collaborative learning in K-12 classrooms’. Paper at the Educational Multimedia, Hypermedia and Telecommunications Conference, Seattle, WA. Ino, A. & Yabuta, Y. (2015). The effects of video SCMC on English proficiency, speaking performance and willingness to communicate. In F. Helm, L. Bradley, M. Guarda & S. Thouësny (Eds), Critical CALL – Proceedings of the 2015 EUROCALL Conference, Padova, Italy (pp. 254-260). Dublin: Research Publishing. Jauregui, K., Graaff, de R., Bergh, van den H & Khriz, M. (2012). Native non-native speaker interactions through video-web communication, a clue for enhancing motivation. Computer Assisted Language Learning Journal, 25(1), 1-19. Lawson, T., Comber, C., Gage, J. & Cullum-Hanshaw, A. (2010). Images of the future for education? Videoconferencing: a literature review. Technology, Pedagogy and Education, 19 (3), 295-314. Bio: Ruby Vurdien is the director of White Rose Language School in Spain. https://whiterose-valladolid.com/es/ She has been an EFL teacher for over 30 years and she is also a Cambridge Speaking Examiner. 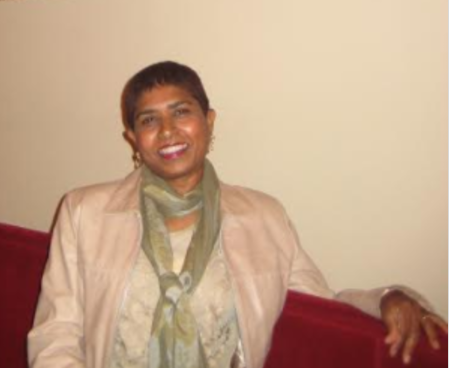 Her research area is CALL and she has several publications, including a book chapter. The Zoom project was presented at IATEFL Glasgow 2017.